You are currently browsing the Suburban Homesteading – Frugal Living blog archives for October, 2015. Bills are part of owning a home, there’s no getting around much of it. Sure, there are things you can do to minimize the expense. using electricity in non-peak hours, taking shorter showers and doing full loads of dishes and laundry to save on utility bills. But, one of the most overlooked bills you can reduce may be sitting at your curb. I’m talking about the trash bill. That monthly payment we turn over to have some guy haul away our debris. However, if you are a homesteader who buys in bulk, cans their own food and composts vegetable scrapes or feeds them to the chickens then your trash can may be fairly empty each week, like mine. When I got tired of paying $40 a month to dump a can with a few plastic grocery bags of trash I called my trash company and explained my situation. I didn’t need weekly trash service, really. Once every few weeks was enough, but that’s not how it works. It’s weekly or nothing. The man on the phone sympathized with my situation and explained that I could request a “Super Recycler” program. Essentially, my yard waste and recycling trash cans remain about the same size, but my “trash” trash can is half the size. It is also half the cost! Perfect. In one phone call I cut my trash bill in half, saving myself almost $300 a year! We all have them…those mostly empty jars of condiments, jellies or peanut butter. But, before you toss them out take a spatula and scrape down the sides and bottom. Most of the time you will gather up enough for an extra serving or two. To get the last bit out of jars or bottles with small openings, like salad dressing or mustard, tip the jar upside down on a plate and let stand for awhile, then scrap off the plate to use. Sometimes saving isn’t all about saving money. Sometimes it’s about using every last bit of something we already have already spent money on. BTW – did you know that 45% of Americans throw food away while it’s still edible? Those “Best-By”, “Use-By” and “Sell-By” dates on packaged foods ARE NOT expiration dates. To learn more about the dates on our food check out this article. I’m sure I’ve mentioned how much I love fall at least a time or two, but it’s true. I love the way the air smells on an early foggy morning, the way it fills your lungs when you take a deep breath; the way it smells earthy and robust in the evening, like rich compost. I love the way the sun glints and sparkles over the dew on spider webs and grass as I head out to the barn to feed the critters in the morning; the way it bounces gold and orange across a late afternoon sky, just before it sets. I love the color of the leaves as they turn red and brown; yellow and gold, I love gathering firewood, picking pears, making soup and tasting fresh pressed cider. Yep, fall is my season, no doubt about it. It’s not the fall of department stores though. You won’t find skeletons or graveyards or scary, gross, bloodied or battered images on my farm, nary a one. My fall is the fall of old, of old European traditions when autumn meant celebrating the end of summer, a harvest put up and a long winter ahead. This is my fall, color and fruit and hearty meals and warm satisfying drinks. It’s a time when part of the garden is put to bed and part is planted with winter hearty seeds. It is a time to reflect on the past and look forward to the future. It’s a time for quiet and peace. My first weekend of October started off with an early departure from work. The drive home was slow and relaxing, my mind wandered from freeway to highway to slow country road. When I finally arrived at the farm I set about watering and feeding, a much easier task since the barn is empty of lambs and meat birds; only the chickens remain. The berries are just about done for the year and our unusually hot summer means we may not have the cool late evening breezes. 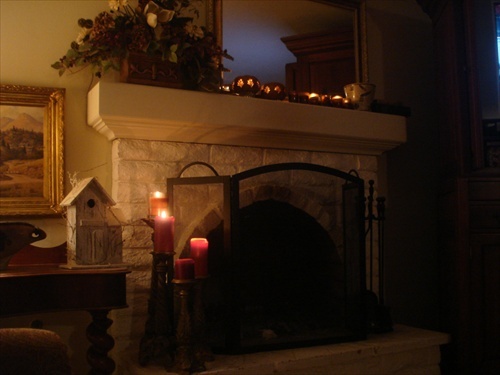 Once finished in the barn and back in the house I set out pumpkin spice candles on the mantel, in the kitchen and on various tables around the house. I love the scent they give off and the glow they lay over the house is beyond serene. I pulled out the primitive paintings of New England fall days, treasures from a trip to Vermont years ago. These are my October decorations. It seemed like I had barely fallen asleep when sis and I were awake and off to a vintage fair up the coast. I love combing the stalls looking for useful old tools and gadgets, or new additions to the kitchen ware. I never pass up an opportunity to add to my gardening and farming collection either. The long day left little to the imagination in the way of dinner. After a quick trip to the barn to collect the day’s bounty of eggs I was in the kitchen grilling lamb chops, making mashed potatoes and sautéing green beans, a simple dinner for a simple season. Sunday was all about the farm and fall. We left the house early to gather a cord of firewood, adding to the stack that will be warmth and ambiance all winter, and found a tree full of fall pears, we picked a few. By mid-morning we were home, setting a new batch of seeds into rich warm compost. Our growing season is long and my goal is to have a productive winter garden. My greenhouse/potting shed is fully enclosed and all my gardening tools, supplies and implements go inside before the weather really turns. It is also my place to think and plant and read and plan. During a short break we lunched on leftovers and filled the crock pot with the makings of a hearty split pea soup; the start of a freezer full of easy meals. It was afternoon when our arms began to feel the strain of swinging a hammer and pounding nails through metal as we repaired some siding on the greenhouse. We pushed on though until the job was finished, then we sat back and admired our handy work. There’s nothing better than working hard in the cool of a fall day. It invigorates you, makes you feel like Paul Bunyan. But, smarter heads prevailed and rather than risking injury by pushing on we quit for the day. When I had showered and rested a bit I made a favorite fall treat— Apple Pecan Gingerbread. The aroma floated through the house while it baked, that, coupled with the scent and glow of the candles made the perfect ending to my first weekend of October. I can only hope they all turn out this wonderful. Preheat oven to 350°F. Grease an 8-inch loaf pan with butter. In a large bowl, whisk together buttermilk, molasses, sugar, butter, vanilla and egg. In a second large bowl, combine flour, ginger, baking soda and pecans. Add apples and toss well. Stir flour mixture into molasses mixture and then spoon batter into pan. Bake until cooked through and a toothpick inserted in the middle comes out clean, about 45 – 50 minutes. Let cool in pan for 30 minutes and then invert onto a plate and serve warm or at room temperature. Ditch expensive book stores and visit your local library’s used book sale; save money while supporting a local endeavor every town should have. For just a few coins you can have a well stocked home library for pennies on the dollar.